It begins as an assignment for English class: Write a letter to a dead person. Laurel chooses Kurt Cobain because her sister, May, loved him. And he died young, just like May did. Soon, Laurel has a notebook full of letters to the dead. People like Janis Joplin, Judy Garland, Amelia Earhart, and Amy Winehouse—though she never gives a single one of them to her teacher. She writes about starting high school, navigating the choppy waters of new friendships, learning to live with her splintering family, falling in love for the first time, and most importantly, trying to grieve for May. But how do you mourn someone when you haven’t forgiven them? And how do you find your true identity when so much of who you were died with the person you loved? It’s not until Laurel has written the truth about what happened to herself can she finally begin to accept what happened to May. And only when Laurel has begun to see her sister as the person she was—lovely and amazing and deeply flawed—can she truly begin to discover her own path. This book should be one that a lot of teenagers can relate to. It has a lot of teenage emotion and angst. And Laurel has so much feeling that she doesn't know what to do with it. There's feelings that she's not sure she should have, and that leaves her trying to shut things out and ignore the problem. 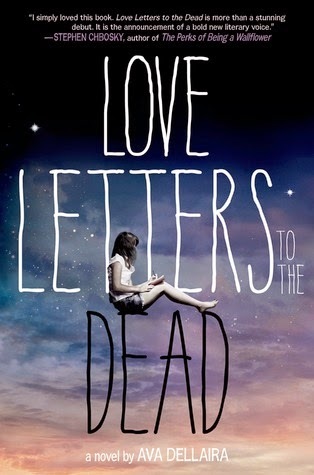 Laurel writes to a lot of dead people in this novel. She's barely started high school, and she's going to school in a brand new district. It gives her a fresh start where no one will no her as the girl whose sister died. But even if no one knows, can she shut out the memories of what happened? As she meets best friends and new loves, Laurel begins to open up. But she doesn't like what she's feeling, so she shuts down. And that's the worst mistake she can make. As her life navigates through the school year, a lot of mistakes happen, but the truth does eventually come out. Honestly? This book dealt with a lot of real-life issues. You've got a young death, a fresh love that isn't traditional (but it's still beautiful), and you have teens trying to prepare for college and their futures. But... It wasn't for me. I thought it way too slow. And it seemed like once the climax hit and we found out what happened, everything took a nosedive with happy pills to make everything end perfectly. However, there was one letter that I truly loved and it got me teary-eyed. For those familiar with the book, turn to page 207. You've got true anger and betrayal, something I have felt before and lashed out with. I absolutely loved this letter even though I did not care for the book. I think contemporary lovers are going to enjoy this novel. It's got a very unique concept in that it follows a diary transcript but in letter-form. And it follows a teenager just trying to live her life and cope with her sister's death.